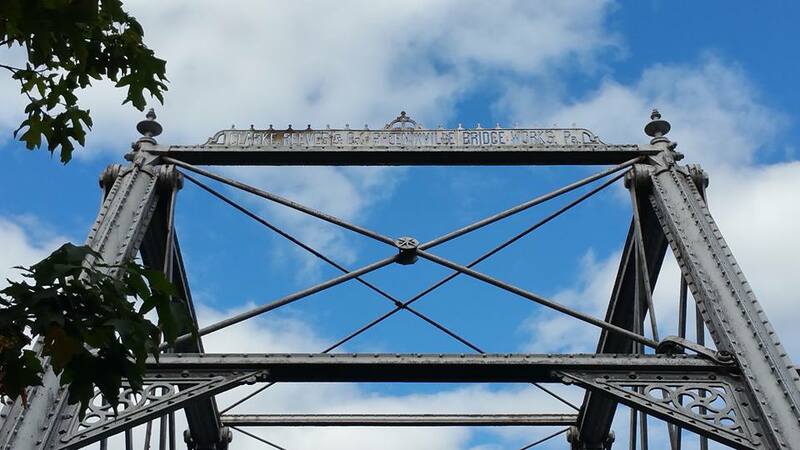 NSRGA is dedicated to historic truss bridge and greenbelt restoration. Julie Bowers is the Executive Director of The N. Skunk River Greenbelt Association (NSRGA), a non-profit she helped found based on the “Friends of Skunk River Bridge” in 2009. They formed up to save an historic bowstring bridge in Iowa. Along with master craftsman Nels Raynor, the organization Workin’ Bridges in 2011, under the umbrella of NSRGA, to assist others across the country in historic bridge preservation efforts. Ms. Bowers is a graduate of Grinnell College and a 4th generation contractor dedicated to providing realistic rehabilitation costs, providing an economical way for those not experienced in bridge restoration to fund-raise, and to making historic bridge preservation economical for off-system adaptive reuse. She is presently involved in historic bridge preservation efforts in 12 states. In 2014, Ms. Bowers researched the reuse of Wiley’s Bridge in Berks County, which lead to her work with Preservation Pennsylvania and PennDOT’s Bridge Marketing Program. Current projects include delivering a variety of historic bridges to DNREC for a trail project in Yorklyn, Delaware. The board of directors has played an important role in the success of NSRGA and the bridges that we have preserved under the moniker “Workin’ Bridges”. Our non-profit has had some truly awesome board members. We are always looking for new board members that can support the mission and the values of NSRGA. This year we finished the McIntyre Bowstring, our flagship project and our beloved truss bridge from Iowa. In order to preserve it we had to become a contractor and work with experts to get it done. They were outstanding. It took nine years. Now we change our tactics just a bit. As we grow out of construction projects and into heritage bridge parks across the U.S.A. we will need a broader spectrum of interested board members that can help make the decisions for the bridges that we can preserve. If you are interested please do not hesitate to call. Currently board members include Laran Bowers, President, Jaydine Good – Secretary / Treasurer and Julie Bowers, Executive Director. NSRGA is a 501(c)3 corporation founded in January of 2010. Workin’ Bridges was formed under the umbrella of NSRGA to pursue hands on bridge preservation. Over the years the team has expanded. One thing remains the same, the fabrication company in Michigan that saved our McIntyre Bridge. Nels Raynor – President – BACH Steel, Holt, Michigan. Nels has been working in the steel industry since the 80s and started his own business in 1992. He has worked on historic trusses since 1998 and began collaborating on historic bridge projects with Workin’ Bridges as a co-founder in 2010. He is an expert in steel and iron fabrication, historic materials including wrought iron, and the hot riveting process. Nels is the founder of Bach Ornamental and Structural Steel, worked on restoring three historic Pratt trusses in Texas through the TxDOT Historic Truss Bridge Program, and has been our master craftsman on the Paper Mill Bowstring erected in Yorklyn, Delaware and the Springfield Bowstring restoration among many others. James Schiffer, PE – Schiffer Group Inc. (SGI) We were delighted to add Jim Schiffer to the team in 2014. He has engineered and delivered plans for five bridges, and added his two cents to site visits, working with the craftsmen to deliver an engineered solution to the bridges we are trying to preserve. Real numbers at the start of a project are important and start the process for well-informed decision making. Derek & Lee Pung – Owners – BACH Steel, St. Johns, Michigan. Derek and Lee made their appearance during the Piano Bridge restoration by DCI in Dubina, Texas. Since then, they have partnered up with Nels to deliver projects from the abutments created for Springfield Bowstring, to the extensive rehabilitation of the McIntyre Bridge which was erected in Delaware the Summer of 2018.